This past weekend I had the good fortune to attend “the largest gathering of Stoics in the history of the world”—Stoicon 2016, held in New York City. The conference was stimulating and thrilling in many ways, and I thoroughly enjoyed the plenary talks, parallel sessions, and the opportunity to meet a number of people whom I knew through their books and/or the online community. A special thanks to the generosity of Ryan Holiday, moreover, for giving every single conference participant a free hardback copy of his new devotional book, The Daily Stoic! Last weekend, however, was also a moment where I became acutely aware that the modern Stoic community can do much better in the way that it approaches the topic of Justice. We Stoics always have to navigate a fragile balance when we present our ideas to the world. Many of our most powerful and appealing psychological tools revolve around accepting events that happen and recognizing that they are ultimately outside of our control. The reason that Stoicism is relevant to such a large and diverse array of people today is exactly because it purports to offer a powerful solution to almost any source of distress: “retire into yourself” (Meditations, 7.28). We are perpetually at risk, however, of having our doctrine of “indifference” toward externals misconstrued for a “neglect” of externals. The benefits of inner peace speak for themselves—but the extreme emphasis that our philosophy puts on personal virtue as an “inner citadel” puts us in an understandably delicate position, politically speaking. Any speech extolling the merits of inner peace and apatheia goes wrong—and in fact becomes positively toxic—the moment that the audience begins to suspect that our school advocates for complacency in the face of social injustice. A great deal of the world’s harms are not inevitable, and in fact are immanently preventable (fate permitting), if only we humans could get our act together. If Stoicism teaches that we should be passive toward these fixable harms, or if our school is quick to “blame the victim” for their own unhappiness while simultaneously ignoring injustice, then our philosophy is immoral, and ought to be immediately rejected as such. Of course, Stoicism teaches no such thing! To the contrary, we believe that no man or woman can be moral (or Happy) unless they work tirelessly for the benefit of all humanity. Justice and Benevolence must be a guide to all of our actions—“any action of yours,” in fact, “which has no reference, whether direct or indirect, to these social ends, tears your life apart!” (Meditations, 9.23). We do not believe that our doctrine of inner peace is mutually exclusive with Justice in any way whatsoever. “It is difficult, to be sure, to unite and combine these two states of mind,” says Epictetus, “the vigilance of one who feels attracted by outside objects, and the composure of one who feels indifferent to them; but all the same it is not impossible” (Discourses, 2.5.9). I believe that contemporary Stoics need to be absolutely unambiguous about the fundamental moral imperatives that are essential to our ethics. Say it loud and clear: the way that we treat each other—and the way that we allow others to be treated by our society—is not “indifferent” at all. Stoicism is a system of virtue ethics, not only therapy, and as such it demands that each practitioner strive to be a force for Justice and Benevolence at all levels of society. There is a little anecdote, preserved in Diogenes Laertius, where we find Zeno confronting a man who had been strongly critical of Antisthenes. Zeno apparently felt that the man had not done his due diligence as a critic, and he reprimanded the man strongly for it: “are you not ashamed,” he said, “to pick out and mention anything wrong said by Antisthenes, while you suppress his good things without giving them a thought?” (Lives of the Eminent Philosophers, 7.1.19). Donald Robertson likes to retell this story and interpret it as illustrating a strong normative principle: if we are going to criticize a person or school, we ought to engage the best of their thinking along with the worst, and to acknowledge what their ideas have to teach us about virtue. This is an idea that philosophers sometimes refer to as the “principle of charity.” Far from prohibiting or undermining criticism, the principle of charity is supposed to make us better, more just, and more incisive critics of flawed ideas. Threading the needle of Stoic Justice becomes doubly difficult when a Stoic tries to go about offering advice to activists about how they can better run their movement. In many cases, criticism of activism effectively amounts to telling victims of hardship, injustice, and oppression how we think they ought to bear their plight more virtuously. This is a very difficult thing for anyone to do in a fair and sensitive way—it requires a lot of research and a generous dose of the principle of charity. It is virtually impossible to achieve, moreover, if it is not clear whether you actually, in fact, care about the injustice in question in the first place. I am completely on board with the notion of insult pacifism. I was raised to value the principle that evil is best repaid with kindness (Romans 12:20), and “that ye resist not evil: but whosoever shall smite thee on thy right cheek, turn to him the other also” (Matthew 5:39). I’m delighted at Irvine’s effort to popularize similar Stoic ideas in his books and elsewhere. In my own personal practice, in fact, I am currently trying to use pacifism toward automotive insults to counter my own tendency toward road rage: pacifism comes highly recommended when you are barreling down the highway in a 3,000 pound projectile! Irvine’s manner of treating the topic leaves a great deal to be desired, however, and I fear that it only reinforces the notion that Stoics are disinterested in Justice in general, and that modern Stoicism, far from taking a charitable interest in contemporary activism, is indifferent or even hostile to the concerns of marginalized people. First, Irvine’s Stoicon presentation is lopsided in that he is largely silent on the need for Stoics to work for Justice at all—a weakness that is shared by his 2013 book, A Slap in the Face: Why Insults Hurt—And Why They Shouldn’t (Oxford University Press). But his approach indeed becomes “worse than silence” when he chooses to frame his talk as a one-sided criticism of contemporary social justice activism. In the chapter of his book titled “Societal Responses to Insults”—which could have included a discussion on how we can work to make the world a better, more Just place for everyone—Irvine opts only to zero in on what he calls the “political correctness code” that emerged in the 1970’s and has since, in his opinion, gotten way out of hand. “If Stoic philosopher Epictetus had been alive to watch the rise of hate speech laws, and, more generally, the political correctness movement,” concludes Irvine, “he would have shaken his head in disbelief. According to him, the best way to spare people the pain of being insulted is not to change the world so that they never feel insults; it is instead to change people so that they are, in effect, immune to insults” (p. 182). Now, there is plenty worth criticizing when it comes to activism on college campuses and society more broadly. Whatever nuances may be involved, I don’t for a moment pretend that all of the widely publicized cases in which students have inappropriately stifled free speech, inhibited their own exposure to challenging ideas, or capriciously assaulted the academic freedom of university professors in the name of “safe spaces” are defensible (if this specific issue is of relevance to you, I encourage you to have a look at the 102-page report that PEN America released this week; a short summary can be found here). I myself accept the Stoic view that anger is always irrational and vicious—a position which, if I’m not careful, easily gets me into hot water with the activist community! The problem is not that Irvine has criticized these abuses of popular social justice ideas, or even that he apparently finds the concept of microaggressions to be useless (though, personally, I would implore him not to throw the baby out with the bathwater). Rather, the problem is that, in the same way that he has approximately nothing to say in defense of Justice despite our school’s well-known reputation for a shallow fatalism, Irvine chooses to show no sympathy—and instead only active contempt—for the fundamental concerns that motivate activism. For contrast, I invite you to have a look at the nuanced criticism of trigger warnings that Massimo Pigliucci wrote last year—which delved headlong into similarly sensitive waters, but only served to spark a very productive and cordial conversation among a diverse readership. I think it forms an exemplary model of how Stoics can treat such difficult topics while remaining true to Zeno’s advice, and while making it clear that we do care deeply about Justice. In short, just as Zeno worried, Irvine opts to “pick out and mention” everything that is wrong with contemporary activism, but to “suppress the good things without giving them a thought.” He allows the imprudent behavior of a misguided minority of activists—behavior which otherwise very much deserves to be criticized—to completely overshadow and eclipse the efforts of those who are working seriously and virtuously to bring Justice to the world. This approach is incomplete, reactive, and cavalier, and it is doubly problematic in a talk that explicitly purports to give marginalized people advice on how best to cope with oppression and hate speech. Pigliucci, meanwhile, also strongly rejects what he sees as the general thrust of student activism with regard to trigger warnings. But he takes care to acknowledge the legitimate concerns, where they exist, that motivate the various voices involved in the controversy. Faculty have a human and professional duty, he says, “to be sensitive, rather than dismissive, to students’ concerns.” The result is not just a presentation that is less likely to offend, but one that comes across as better researched, commonsensical, and highly persuasive. These are the fruits of charity. As Irvine delivered his pithy summary of campus activism, the predominantly white male audience laughed heartily—oblivious, it seems, to the sensitivity of the subject. In the meantime, my wife—a black, female graduate student who is probably better educated in the scientific literature on microaggressions than both Irvine and 90% of the Stoicon audience—was having a very different social experience. She had come along to New York as a favor to me, to see what this philosophy is that I’ve become so interested in lately, and to learn about how it relates to Cognitive-Behavioral Therapy and REBT. But in that moment, she became acutely aware of one simple fact: it did not appear that ethnic minorities or their distinctive concerns are welcome or wanted, much less understood, in the modern Stoic community. “Alienating” is perhaps too weak a word to describe how she experienced Stoicon. Stoicism is remarkable among the world’s major religio-philosophical traditions for its history of including the voices not just of emperors and wealthy statesmen but also of people with physical disabilities, mental illness, and chronic pain, victims of torture and PTSD, and prisoners serving life sentences. But when marginalized people encounter Stoicism today, do they come away believing that Stoicism has something to offer them? Or do they come away with the impression—right or wrong—that Stoicism is just one more system created by privileged people who are out of touch with the severity of the world’s fixable injustices? If people find modern Stoicism’s advice for victims of injustice off-putting, it may have more to do with the choices we make about how to go about presenting that advice than with what the ancients have said. Being resilient to insults and being an active agent for Justice are not inimical objectives, and while I accept Irvine’s call to the former, I would caution him that he has gone too far in his neglect of the latter. I believe that Stoicism can do amazing things in the world of politics and philanthropy if we create a space for those “constructive dialogues” to take place—especially if those dialogues are rooted in Zeno’s principle of charity, and if they implement the Socratic model, in which we “stop at point after point, and make out what each person is willing to admit and what he denies” (Cicero, De Finibus, 2.3). Moreover, I strongly suspect that the Stoic emphasis on the four cardinal virtues offers a uniquely powerful antidote to the pervasive miscommunication, polarization, and rancor that seemingly attend all political arguments. A Stoic is someone who cares about personal resilience and Temperance, but who also cares deeply about Justice. If we present ourselves this way, the world should never have reason to be confused on this point, or to doubt our support for both social justice (whatever exactly that means) and personal virtue. Our school teaches that virtue is one, after all, and that if we separate it into pieces, we destroy it. In my opinion, Stoicon left something to be desired when it comes to getting these values across (notwithstanding Christopher Gill’s excellent and helpful presentation on the history of Stoic activism). But the conversations at Stoicon were neither the first nor the last word on the matter. That is why, starting now, some of us are coming together to form a Facebook group called “Stoics for Justice,” as a space to push Stoic philanthropy forward and to find ways of working together to pursue the “common benefit” (as Marcus liked to say). Whether you prefer radical activism aimed at disrupting oppressive power structures, or whether you see your role in the world as focused on community building, education, and hands-on philanthropy—or, yes, even therapeutic training in becoming resilient to insults—you should be able to find a role to play in any hypothetical Stoic-led movement for Justice and Benevolence. Come join us at Stoics for Justice and let us know how you think we might move Stoic philanthropy forward on the issues you care about most! Thank you to Kristen de K., John Martin, Charmika Stewart, and Arianna Scott for their very helpful feedback on earlier versions of this article. Eric “Siggy” Scott writes the blog Euthyphroria. He is interested in moral practice as a way of life, and in how secular and religious people can find common ethical ground (a question which Socrates raised in Plato’s Euthyphro). In real life, he is a PhD student in computer science at George Mason University, where he does research on machine learning and evolutionary algorithms. At this point in history, it’s hard to justify the idea that Americans of mixed African heritage actually have any “special concerns.” African immigrants are experiencing huge economic success and do not report any significant racial discrimination. At this point, what’s relevant is, as MLK said, the “content of your character,” and not your melanin count. I realize that’s hard to accept for many “blacks,” but it’s time to graduate from victimhood and become a full and equal citizen with equal responsibilities. It’s hard to stop the whining and take responsibility for one’s own life and community. It’s hard. But the alternative is to keep blaming white people for one’s problems and for one’s community’s problems. That just leaves people of mixed African-European genetics at sea with nothing to do but wait for “white people” to solve their problems. “White”? Meaningless. Who cares what your skin color is? “Black”? Equally meaningless. The whole idea of race is an idiotic conspiracy against liberty, dignity, and science. Let’s just drop it. Drop the affirmative action privileges. Drop the special status that gives you extra places at uni. Drop the definition, en toto. Stop defining yourself by your melanin count, and invite everyone else to do the same. How does that fit with Stoicism? Because skin hue is not something you control, and is not in any way a concern of rational people. If it stopped anyone from succeeding, then African immigrants and West Indian immigrants and their children would not be succeeding, as they are (not just in the US but in the UK and elsewhere). Good or ill for the rational social being lies not in feeling but in action: just as also his own virtue or vice shows not in what he feels, but in what he does. Marcus Aurelius, Book 9, 16. While I still find the term social justice rather arbitrary, I must say that I enjoyed both Irvine’s perspective and this author’s perspective. I believe that the Stoic position on activism is somewhat paradoxical, which makes for fascinating discussion. Stoics have a duty to our communities, but when we act, we act with the understanding that the results are out of our control. ​Moreover, Stoics must use prosoche in every decision about political and social involvement. Prosoche is attentiveness or mindfulness to every situation, used to determine the proper judgement needed to maintain eudaimonia. This involves some self knowledge. ​Marcus Aurelius advocated an unwillingness to take sides politically, a respect for the opinions of others, a disinclination to meddle in the affairs of others, and not listening to gossip and slander. Marcus Aurelius’ criteria for community involvement – not taking sides politically – does not describe most activists today. A Stoic activist should respect free speech and act with politeness, yet also realize that we can’t control whether we cause offense. We should exercise discretion in action. A Stoic activist is, or should be, a far cry from the characature of an angry, irrational, social justice warrior. The distance I advocate has its source not in cold unconcern, but in caring. If we wish others well, we let them flourish as they will, cheering them on from a distance. Leaving others alone because we want them to do well has as its flip side helping them when the need arises…in emergencies and when obstacles are overwhelming. Moral wisdom consists largely in knowing when to leave people alone and when to help them and, when helping them, how not to subvert their aims. I think the Stoic position is indeed paradoxical! On the surface, at least. For me, that’s exactly what makes it so fascinating and powerful. It’s that crucial “both/and”: *both* Herculean inner strength (which refuses to be ‘hypersensitive’) *and* a recognition that eudaemonia is impossible if we allow ourselves to be complicit toward injustice (thus refusing to be ‘insensitive’). Social Justice Warriors attempting to infiltrate Stoicism….good grief. Lol—well, we may have already succeeded! Despite the way it seems on the surface, Stoicism offers a great framework for criticizing cultural norms. I have yet to hear of any realm of human endeavor that an academic couldn’t fashion into a “framework for criticizing cultural norms.” That’s more or less the job description these days. I’d love to hear Epictetus’ thoughts about today’s obsession with identity politics and the many advances we’ve made in the grand science of taking offense. Social Justice does not equal Justice. It seems to me that what current Social Justice Warriors are championing is in direct opposition to Stoicism. Forcing equal outcomes upon people is not Stoicism. O.D. : “Social justice” refers to a wide variety of things—IMO we shouldn’t let the term be spoiled by a few people we happen to disagree with. I’m not sure we should redefine Social Justice to suit Stoics. I chose (indeed was told) to find out what Social Justice truly was and how it began, and what I found wasn’t good. The Wikipedia page told me about combining the principles of two incompatible world-views, Socialism and Stoicism’s descendant, Liberalism. Since Liberalism and Socialism mainly differ on the subject of how to treat the rich, this had the effect of turning the result into Socialism. Combined with the strong presence of Marx in academe has led to an extreme form of activism. I’m told Rawls has a good description of the theory of Social Justice, and it should be simple to see how it conflicts with Stoicism. His book is also available through Amazon Kindle. Are Irvine’s comments to which Scott is responding available on this website? If not, where is the “justice” for Irvine? I have no way of knowing if Irvine said these things or if Scott is accurately writing about them. Given that Scott, on several occasions in this piece, speaks for both Irvine and the reader, I’m inclined to believe the author was not about to let accuracy get in the way of SJW activism. You can find the video of the presentation linked to specifically in the piece. Given that Stoicism takes the cosmopolitan view–the brotherhood of all mankind, so to speak–it’s probably fair to say that it doesn’t have much (anything?) to say to ethnic minorities qua ethnic minorities. The philosophy addresses human concerns generally, though, and to that extent is applicable to anyone who has ever felt marginalized, alienated, or undervalued, which I assume is probably most of us. Absolutely, we are to do our best to live virtuous and just lives, which includes expanding our circle of concern to embrace the rest of the human family. We should address genuine societal problems with all the energy we can, but we also need to understand that as individuals–our ethnicity or station in life notwithstanding–externals such as insult or even physical attack will always be matters of indifference to the state of our souls. See nearly any page of Epictetus, the former slave, for vigorous confirmation of that principle. Encouraging personal resilience and indifference to indifferents will always be in everyone’s best interest. I understand that may not be a welcome message. Stoicism is strong medicine, and I can appreciate that its precepts might come as a shock in this era when right thinking about identity politics, not virtue, has become the summum bonum. Thank you for this well-written article. I think it is clear from any reading of Epictetus that virtue is the sole good in Stoicism, and that William Irvine’s Stoicism while interesting and useful in its own right fails to put virtue at its center. Donald Robertson very gently illustrates in his book Stoicism and the Art of Happiness that Irvine’s Stoicism is more hedonistic and thus has more to do with Epicureanism than Stoicism. While I think we Stoics have much to learn from Epicureans, we also have a different philosophy of life. Ours is not so much a philosophy of ataraxia or inner peace, but of arete or moral virtue and human excellence. Ataraxia is about feeling and about me, whereas arete is about doing and about others. No one can achieve arete who retreats from their social duties. The good life for a Stoic necessarily involves considerations of justice and fairness for all, and indeed even cultivating *love* for all human beings. Not even listening to the cries of people suffering under structural oppression is far from love. I don’t look up to people as moral exemplars who ignore or belittle the suffering of others just because they themselves feel uncomfortable hearing about it. While I cannot control whom others decide to look up to, I also cannot fathom why others would see caring *less* as more virtuous. Thanks Eric for a very informative piece and I really value the sentiments expressed. Duff, I’m getting a bit confused as this is the first time I’ve heard William Irvine referred to as an Epicurean (note to self to read Donald’s book). I’m not a Stoic, I’m a philosophy and psychology student who started following this site three years ago and have found it both educational and therapeutic at various intervals. As a result I’m very grateful to the Stoicism Today team. I didn’t make it to NY to see Bill’s talk this year but last year in London I remember him suggesting that good Stoics should be happy to admit they are wrong, even if they are not, in order to live in harmony. Whilst I could see the logic in trying to maintain inner peace by controlling one’s emotions when things don’t go to plan, I could envisage complete psychological torture if one was battling to do this against their will. Hence whilst I aspire to be stoic at times, I’m content to opt for the freedom of not being a Stoic, either ancient or modern, and not be ‘excellent’ enough. To a degree you are right, however for the Stoics of old the qualities of the ‘arete’ person would be perceivable in their physical outward activities. There is no difference between the judgements of the ruling faculty and the actions of the body. Stoicism offers a pure materialistic view of the world where our senses perceive ‘bodies acting on bodies’. It’s all there in our ‘science’. The ‘arete’ person is ‘arete’ in that they are seen to act with the quality of justice, for the mental judgement is the physical action. In Stoicism even thought is the physical activity of the intelligent material that is manifested as an individual body, in that only ‘body can act on body’ when it comes to ‘cause’. We now know that the process of thought through the brain is a physical activity, but we are still left with the question as to exactly where does ‘the ruling faculty’ reside, and the logic of the Stoic ‘science’ is that, as the body is manifested out of intelligent matter, the whole form of the individual is their ruling faculty – the individual’s ‘spark of the Divine Fire’ is one and the same as the ‘active principle’ of the creative intelligent matter that manifests their whole physical body. And when it comes to justice and the other qualities it is the action of the whole body that manifest the qualities. In Stoicism, what you see is what you get. At the same time, the quality of justice to be found in the ‘arete’ person is also the same quality of justice that society’s customs and laws *ought* to demonstrate in their activities. For Stoicism there is no real ‘internal virtue’ of justice. Justice ‘is imposed on us from outside’ in that it is ‘known by all sane people’ as part of their being born as rational creatures. 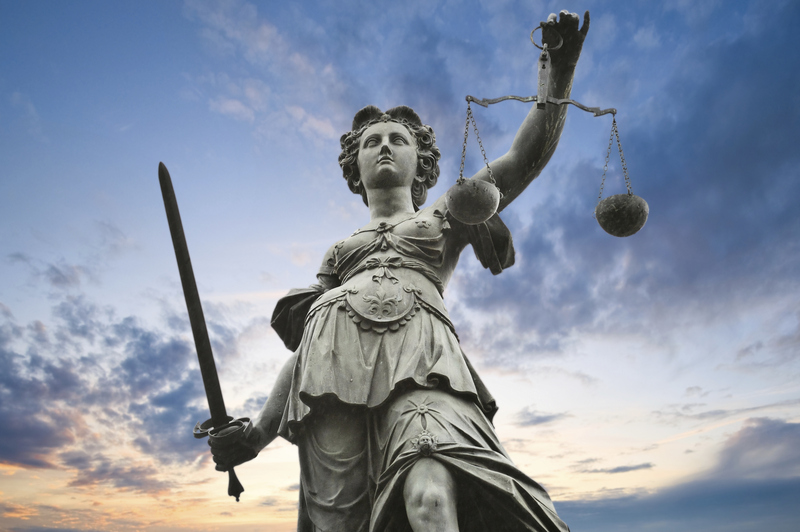 The quality of justice is born into each one of us. It is for us to exercise it and not to let it atrophy or get perverted. And the justice of the ‘polis’ takes its lead from the citizenry as a whole. By nature the law of the land and the administration of the state should be truly just, but if the majority of the populous turn their back on justice or look only to what they believe is just for themselves without thought of the whole, so the justice of the land will be perverted – which is why ‘human rights’ are a fallacy that Stoicism does not support in that we ought instead be looking to ‘responsibility’ both from the individual and also from all aspects of society. Stoicism encourages all individuals, organisations, corporations, state bodies and governments to act responsibly in the best interests of the whole with the view that what is in the best interest of the whole will also be in the interest of the individual. That is they must all act with wisdom, courage, justice and moderation. As a society we create the justice the state imposes on us. So as individuals we can both look to the justice we have total control over while at the same time try to influence the course of justice within the state by encouraging as many people as possible to up their game, regardless of their faith, and through their own example help swing the collective will towards ensuring that society is just – not through force of argument but through example. Stoicism teaches that we should learn what we control and what we do not. One should let go of what one cannot control. The author of this post seems overly concerned with the opinions of others. ANY speech extolling inner peace and apatheia, for instance, that is perceived by the audience as meaning apathy to social justice, is toxic, in his thinking. Notice how there is no burden on those doing the perceiving to inquire further or seek clarification for themselves. If they don’t like what you say, even if all they do is suspect something which might not be true, the burden is on you to change. So, be virtuous all you want, but if others begin to perceive your virtue as harmful, then it is you who are at fault. You are, in short, responsible for something you cannot control, the thoughts of others. People’s thoughts are always subject to their biases, circumstances, and experiences. You, as an individual speaking to such a person cannot predict and certainly cannot control (and you should not really want to, if you value your time) their reaction. The author’s insistence that Stoicism requires concern over what one cannot control seems very disconnected from the Stoic principle of letting go of such things. I think we need to define terms better before this discussion can progress. At least some of the disagreement here may result from the rendering of dikaiosune as justice. No Greek word has an exact match in English, and the rendering can cause a lot of problems. Dikaiosune in ancient philsophy seems to me to be an internal virtue – a personality trait that one embodies, not an outwardly focused righteousness as in the modern sense. Dikaiosune is a moral virtue that we embody, not something that is imposed on us from outside or that we can go around demanding from others. The translation and semantic issues lie at the heart of this debate. We need to know what the ancients meant by their words if we expect to understand this philosphy in its original context, not just how me might apply it the modern context. This is the most interesting piece for what it says between the lines. We are offered life experience from the hallowed protection of the university campus. We are having the immature stance of so called student activists being defended against the equally problematic stance of career educationalists, many of whom have little experience of life outside of books and the academic life. At the same time we have an undercurrent of micro aggression against that minority that supposedly bears all of the guilt for all of the problems in the world – the white heterosexual male of European descent. Has no one studied history to see just how much mischief has been caused by people of other ethnic origins (and also the women that make up the majority of all such cultures including the white European)? No group is free from the tribal instinct that is demonstrated through distrust of and discrimination against anyone who is different. Even the gathering together as a group of ‘activists’ relies on pandering to this instinct instead of being Stoical about it and so addressing it rationally and reasonably. A little rationality, compassion and balance would not go amiss. The very justice that this article is asking for is totally missing when it comes to its assumptions and its proportioning of blame. To comply with the suggestion of saying something positive, we do have reference as to how ‘Modern Stoicism’ is problematic when it comes to addressing the perceived injustices of the world. I have for some time been pointing out that Modern Stoicism offers a ‘shallow sort of fatalism’ that is not present in traditional Stoicism- which will be obvious to anyone who has studied and understood the whole sphere of the classical Stoic teachings – especially its science. In truth, it is the so called ‘Modern Stoicism’ that is shallow in that it is a shadow of the real Stoicism that is so much more than the ‘CBT plus’ that this pseudo Stoicism offers. Traditional Stoicism is a complete practical and spiritual life philosophy that moves beyond the therapeutic mind training to an understanding of the true nature of existence and our place within the scheme of things. It is based on rational premises that include a belief system, a science and the ethics that guide a person to living the ‘arete’ life whereby they manifest the qualities of wisdom, courage, justice, and moderation. How could anyone versed in or anyone explaining Stoicism not realise that for the Stoic justice is a fundamental aspect of our lives. Just because we sometimes state things as they are within the context of a particular aspect of a subject does not mean that we do not also take a view on other matters relating to the same issue. Stoics look to the whole picture, and we will continue to stand up with courage for what we believe even when what we say is attacked because it is not acceptable to the emotion driven sensitivities of the ‘political correctness’ police. Is not the individual in control of how they receive insults? What is wrong with saying this? Instead of getting angry and becoming activists, the Stoic is encouraged to take part in civil matters and so to change things from within – as appropriate. There are many who are jumping up and down because of child labour in Turkey. They want all the children of Syrian refugees to be stopped from working and to be sent to school. The children are concerned for they want to work for this is the only way their families have of getting any money to feed themselves. And yet the do-gooders are setting out to deny their families any source of income. The child goes to school and they may be fed in the school. The child goes to work and their family is fed. So instead of decrying child labour it would be better to work out how the family can both be fed, have self-respect in that they are providing for themselves and at the same ensure that the children are educated for when they are able to return to Syria – all without being unduly taken advantage of. Too often our so called benevolence is misdirected and actually causes more trouble than its worth. So as Stoics we take care. We do not encourage a blame culture where everything is always down to someone else. We encourage people to do what they can for themselves and that includes changing their opinion about their situation or how they are treated. But we will also try to see if we can improve on situations where we can bring influence to bear. As such we also encourage our elected representatives to do what they can to ensure that civic life works for these over whom they have influence – so instead of being a campus activist, students could concentrate on getting qualified and then, to satisfy their conscience, take a low paid job working to help those in need. However, just how many of the so called ‘activists’ will leave university only to become part of the problem because they set money and position as being of greater importance than following up on their ethical views. How many will realise that there is the possibility of having both – money and power and at the same time an ethical input into the civic life that their wealth and position grants them access to. As Stoicism tells us, money and power is not the good. The value of money and power lies in what you do with it. Now how much of this do you find being discussed on sites devoted to ‘Modern Stoicism’. Such sites are all about ‘me’ and not ‘us’. Whereas while traditional Stoicism will often say what is not considered to be ‘politically correct’, it will say what is rationally correct. So instead of looking for what has not been said in this book or that lecture, look to what has been said and then move onto the other viewpoints that Stoicism has on the same subject. Much more will have been written or said in some other book or lecture where the subject matter puts it in context – especially if the book or lecture is about traditional Stoicism rather than ‘Modern Stoicism’. Traditional Stoicism teaches us how to incorporate both into our lives. While Irvine has his adherents, and does well to fertilize the ground for the ascetic side of Stoicism—which is quite necessary—I have long looked forward to a solid, public repudiation for the unnecessary and uncalled-for negativity he and his followers express, outright, about social engagement. I thank Eric Scott for his lengthy, detailed exposition in that endeavor. He does us all a great service toward that end and I hope he gathers a large readership.